A former superintendent of the United States Military Academy at West Point, New York, Robert E. Lee is perhaps the most famous general officer of the Civil War. A Virginian, Lee was offered command of all Union forces at the outbreak of the war but refused and resigned his commission in the U.S. Army, unable to raise his hand against his native state, which had seceded. 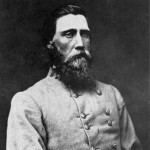 As the commander of the Confederate Army of Northern Virginia, Lee became a legend, taking great risks and winning several major battles due to his audacity and the battlefield competence of lieutenants such as Thomas J. “Stonewall” Jackson and James Longstreet. However, modern historians have criticized his performance at the Battle of Gettysburg. Lee surrendered to Union General Ulysses S. Grant at Appomattox Courthouse, Virginia, on April 9, 1865. After the Civil War, Lee became president of Washington College in Lexington, Virginia. He died in 1870 at the age of 63, and the college was renamed Washington & Lee in his honor.